SimplyMepis is a Debian-based distro developed by Warren Woodford who believed that Mandrake Linux was too hard for new users. (Mandrake, now Mandriva, was the Ubuntu of its time). I’ve heard him interviewed a few times on The Linux Link Tech Show and he seems to be of the realist (as opposed to idealist) school of Linux distro maintainers. He believes users should be able to listen to MP3s, use Adobe Flash, and so on. SimplyMepis 8.0 is based on Debian 5 stable, which I recently reviewed. So let’s load her up into VirtualBox and see how it goes. Based on previous experiences, I chose to load the SimplyMepis Failsafe version off the LXF DVD. The usual kernel messages went by as my hard drive and other components were discovered. This took quite a long time, but I am running it in a virtual machine. Eventually, the KDM screen loaded up. So I log in to the live CD. In case it was running from the DVD drive in addition to running in the VM that was slowing everything up so much, I decided to install right away. Except, I didn’t have the installation icon on my desktop. So I went command line and found it. The command to run is minstall. Didn’t work. So I su’d to root and got it to launch. Then it complained about not being able to connect to the X server. Maybe failsafe was not the way to go? I reset the virtual machine. That didn’t change anything – the installation is still not on the desktop and I get an error each time. Not very polished. Although, it could be a VM issue. I still couldn’t do it – even trying kdesu. So I rebooted the VM and this time I plan to login as root. NOW it had the installation icon on the desktop. This was very promising because it took me over 2 hours to get this far. It froze. So I thought perhaps there’s a problem with the LXF DVD or maybe it’ll work better if the CD ISO is on my computer. So I went on to the Mepis website and got the CD ISO for SimplyMepis. Booting up was just as slow as usual. This was very, very annoying. I have run all the distros I’ve reviewed in VMs and they are usually a lost faster than this. Alright, it still didn’t work. I”m really fed up with this so I try to just try it as a liveCD in my computer – no VM. This runs a helluva lot faster. So, folks we’ll have to have a LiveCD (from the LXF DVD) review here. The menu is a little annoying. It takes 4 levels to OpenOffice.org Writer. K Menu->Applications->Browse All->Applications->Office->OpenOffice.org Writer. Let me rephrase that, very, very annoying. Wait a minute, you can also access it via K Menu->Office->OpenOffice.org. The menu needs a bit more polish, it seems. The default Desktop Environment is KDE. All the configuration appears to be through the standard KDE Control Center. Gimp appears not to be available by default, at least not on the liveCD. Unlike most of the other distros (and even many of the lightweight distros) there are not any bit torrent programs installed by default. Kmail is available for email, Firefox and Konqueror for web browsing, Kopete for chat, and Akregator for RSS feed reader. One really good thing they’ve done with the menu is to have the programs listed as function (program). For example, “web browser (Firefox)”. This way, a new user doesn’t have to guess what Akregator is. In the multimedia front are Amarok for music, KMplayer for videos, and k3B for burning discs. The default font for firefox is attrocious and hard on the eyes. On the plus side, there is a User’s Manual on the desktop which appears to be very good at explaining what SimplyMepis is al about. I’m sorry this review had to be such a shallow review. I was really looking forward to attempting to install SimplyMepis and see how the installation differed from Debian, Ubuntu, Linux Mint, and other Debian-based distros. But it refused to work with Virtual Box. On the surface SimplyMepis appeared to basically fall just short of a lot of other full distros. It seemed to have less programs – at least it had less programs on the liveCD. It also left a less favorable impression on me than Antix, which is based on Mepis! I felt the distro lacked just that little bit of spit and polish that Fedora, Mandriva, Debian and Ubuntu have. From the slightly schitzophrenic menus to the horrible font in FIrefox that made me go right back to my other computer after capturing that desktop screenshot. I’ve heard some pretty good stuff about Mepis in the past, so I think this is probably just a fluke. Perhaps SimplyMepis 8.x or 9.0 will return to that level. After all, even my chosen distro of Fedora seems to falter every other release. Right now I just can’t recommend it over Linux Mint, Ubuntu, or Mandriva for the new user. Next time it’s on an LXF disc I’ll give it another swing. It must be VirtualBox problem. I installed Mepis on my laptop (Pentium III, 256 MB RAM) with no problems. Fonts on my system are OK. Its a very solid distro. It runs faster than Mandriva and Ubuntu (uses less RAM). Menu is a matter of taste. I have no problem with it. Kde gives you most used programs on the top of the menu. Mepis also has its own configuration tools. You just need to find them in the menu. It comes with firewall out of the box. If you need other programs just run synaptic package manager. The only thing I can respond to here is that I look at what programs come installed by default for two reasons. 1) That’s what someone new to linux would do 2) It says something about the distro maintainers. There are so many programs available for Linux that it says something about the priorities of the distro maintainers. For example, should they have Mono programs installed by default? Should they use KOffice or OpenOffice.org. I couldn’t disagree with you more. I normally find you reviews spot on but this time I have to put in my 2 cents. I run Mepis on a Dell d800 centrino and everything is great. Warren has created a solid, reliable distro that i find has very few if any snags or bugs. Give it another try or chalk it up as a fluke. I think I covered that in my last paragraph where I mentioned that it usually gets pretty great stuff said about it and that it might be my fault for using the VM. I’ll give it another shot when the next version comes out. In recent weeks it has become clear that people should not post reviews of distros using VirtualBox, or any other emulation environment. The reasons should be obvious to anyone. After trying a dozen distros I discovered Mepis to be the one which worked the best on my mainstream hardware. 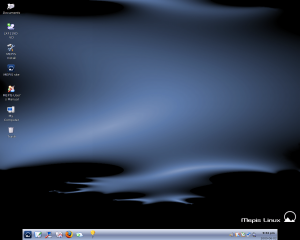 Even so, I am using Windows7 most of the time, as it provides access to applications I need. Too bad all the linux folks focus their attention on creating their own flavors of operating systems, when that energy could have been better spent working on standard programs to compete with Windows or Mac. My fear is that Windows7 will do serious damage to any momentum linux has gained. Should Apple ever open its OS to run on non-Apple hardware, it would effectively do the same. First of all, after looking at your ‘About Me’ page, you look like a ‘stand-up’ kind of person who shares a lot of philosophical underpinnings with me. I commend you on your stance on DRM, and respect that you are a knowledgeable Linux user/developer. I even forgive your typo on the second line; I believe you mean ‘boxes’, not ‘boxen’. It just shows that you are human, like the rest of us, and susceptible to errors of commission and omission without those errors being intentionally malicious or devious. That being said, we are worlds apart in our approach and attitude toward what makes a good Linux distro. Not trying to be mean spirited, but the way you approached the review, and the criteria you placed upon whether the distro in question is a ‘good’ or ‘bad’ one comes from a perspective of techno-elitiism that, I believe, is a detriment to helping Linux acquire a greater end-user market share. I’m talking ‘meat and potatoes’ market share, that attracts youngsters, moms and pops, and the techno-hip younger generation with iPhones and MP3 players diligently stuck in their ears. I have been using Linux in my home, exclusively, for about 5 years. Since being literally driven away from Microsoft based upon multiple reasons, but primarily end-user apathy (the cruelest of all emotions) I now enjoy my computing experiences in Linux so much that I devote 3 computers toward my simple simple needs; 1> desktop 1 that basically contains all the data pertinent, and pleasurable in my life, 2> desktop 2 that serves as a ‘tester’ machine, where I experiment, and learn from, the latest and greatest distros and then change them as soon as I have received that subjective level of knowledge where my curiosity for newness overrides my comfort zone, 3> laptop 1 that is my ‘happy place’ where I can retire to the bedroom at night and enjoy Linux with one eye and TV with the other. I understand the command line fairly well, if I stay within basic commands or have a REALLY good ‘paint by the numbers’ guide. I know the difference between window managers and operating systems (a level of understanding most Windows users are not privy to), and I have dabbled with APT and Aptitude, but prefer the comfort of Synaptic’s gui to do the ‘adds, deletes, and updates’ necessary to keep my OS of choice up and running smoothly. Your review, however correct it may have been, went right over my head. And most of the other ‘great unwashed’ that use Linux to do the simple, pleasant computing stuff in life like surfing the web, emailing friends and relatives, and maintaining personal photos, music, and videos (short and legal .swf, and .wmv stuff — not the bootleg movie stuff…). What irritated me most about your review experience is that it has little, if anything, to do with the group(s) of people I referred to earlier. The ranks of Linux users are fairly thin, but out of 1,000 regular Linux users, how many would know what an ‘LXF DVD’ is? How many regularly use ‘virtual boxes’ in their everyday computing life? How many know what a personal GPG key is, what it is for and how to get it? If they are Windows refugees, like many of us, these technical fine points would go right over their heads. In other words, your review is really directed, in my meager opinion, at a very exclusive minority. This ‘great unwashed’ group I have mentioned, moving toward Linux, exist on a much different plane of knowledge. Live CDs — yeah, md5 checksums — not so much (how do I do them while in Windows? ), virtual boxes, maybe read about them but not too sure what they would do for me, personal GPG keys — huh? I run simplyMEPIS 8.0.6 quite happily on desktop 1 and laptop 1. I currently run LinuxMint 7 on desktop 2 — a high quality distro that, like MEPIS, allows an end user to be as technically astute or ignorant as they chose to be. Both have outstanding end user documentation and friendly, helpful forums. They are both models of what a good Linux OS should be. On your next review(s), think about your target audience before you put ‘pen to ink’; your petulance over not getting the technological entrance you desired really colored the opinions you expressed. You mentioned that even your distro of choice, Fedora, only ‘hits the mark’ every other release. I find Fedora foreboding, obtuse, and condescending to all but the most technically competent end-user; they do not suffer fools like me gladly. Thank goodness there are distros like simplyMEPIS and Linux Mint that do. I don’t have a personal GPG for my email. I don’t know how to get one or exactly why I would want to use one, but the email address I have included is the one I use for all my Linux correspondence (I have another one if my bank or insurance company wants to let me know I am late on a payment), and you can reach me there, if you choose…. Here’s hoping your next swing through MEPIS-land is more to your liking. He has pinpointed his audience and written for it. You are not that audience. Either start Googling or be quiet. Why should he dumb his review down because you don’t “get it” so to speak? The only people that would care about this review are people who know that an LXF DVD is what Eric uses to get his distros that he tests – a DVD in Linux Format magazine. Your premise is downright, flat out wrong and demonstrates that the “Me” generation is not limited this round of teenagers. You fail to comprehend that if you don’t understand something it doesn’t someone else won’t find meaning in the work. The MEPIS review mirrored my experiences. If I cared, I could get everything working, but I don’t care. I’d rather just use stock Debian KDE. Well, at least I’m not the only one that had problems. I did read somewhere else (web or LXF) that they said it didn’t have as much polish as is usually the case in Mepis. I’ll try and take that into consideration. I think I mentioned it when I first started and forgot that not everyone has been along the ride with me from the beginning. On the other hand, as Nobody Important says, there is a certain level that has to be assumed or next thing you know I’ll be explaining how CD-ROMs work. I’ll do my best to find a happy medium. I have 4 more reviews coming up over the next few days, so I’ll try and keep that in the back of my mind. “So let’s load her up into VirtualBox and see how it goes.” After this line here I knew that the review would not be a review on SimplyMepis but on VirturalBox trying to run SimplyMepis. No matter how many distros you review if you do it under VBox then you don’t have a proper review. Buy another hard drive to test distros if you want to write reviews. When I test a distro, and I’ve tested many, I always use a test partition and that always works the best for me. I never found any of the problems with SimplyMepis that you had. Linux, which is the kernel used in different distros, in not in competition with MS or Apple. I can’t understand why people think it is. MS and Apple are in the business of making a lot of money. That’s what they do best. They can’t harm any Linux distro. I also have Windows 7 RC and there is no danger. Of course we heard the same FUD when MS came out with Vista the great LInux killer. I too have to use MS Windows in my line of work which is PLC and robotics prograjming but I need it for nothing else. (except for a few games) It’s never good for one corporation to own a person’s computer and with everything else that’s installed by MS and Apple, that’s what they try to do. Point taken, but that’s my work-flow and I’m sticking to it. Is this a review? Everyone uses Virtualbox as if it was a real computer. Please, install it on a real computer then make your review. No, i don’t use Mepis anymore but i think is unfair using Virtualbox for this kind of reviews. Hi – I read your ‘review’. I am a member of the Mepis Community. I’m quite heavily involved – including looking after the Community run repository, contributing in the forums, assisting with art etc. Because of my involvement, I always take note of intelligent constructive criticism. Your points on the menu system are noted and valid. Also the speed in vitual box. For some reason ‘8’ is a lot slower in a VM than ‘7’ was – but it is lightening fast running in a real environment – but then you didn’t try that …. Ok – I hope you take the following crtique in the spirit it is intended. In vbox, I mirrored your ‘failsafe’ experience. No desktop. BUT, in the grub menu, it specifically mentions the VESA option as being the optimum one for virtual machines. Did you try that?? I did – instant desktop. Because you didn’t go through this, you couldn’t talk about the installer, the speed of installation, or anything a normal review would undertake. BTW – the “default” option from grub also works for me in vbox. Like you said – could have been the LXF DVD. But after you got the iso – why didn’t you just mount the iso in VB and try the VESA option as clearly stated in grub? No 2 – I agree, the menu is messy (with the top ‘applications’ menu). The reason for it is simple. KDE apps should (as long as they are compiled properly) – find their rightful places in the menu system. In fact most GTK apps do same. But there are some apps that simply refuse to. So for these, Warren keeps the other menu handy – just in case. Personally I’d like to see him drop the alternate menu – but that’s his perogative I guess. No 3 – fonts. Very much a personal perspective. What graphics driver did you have running – or did you use the failsafe option … ? See where I’m headed? With the correct driver and screen at native resolution, you would have noticed a world of difference. No 4 – agree no ktorrent. Some things had to be left out to get everything on a CD – and Warren decided it was more important to include both Writer and Calc (which personally I agree with). As you’ll well know – the installation of ktorrent or deluge is only a click away once you’re installed. No 5 – why is that we hardly ever see anyone mention the forums, the wiki, the other attributes etc in a review? In fact with the problems you had, it would have been great to see you drop in (however briefly), ask a question, receive the help – and go away better for the experieince. Something to think about for future reviews perhaps? Thanks for mentioning the documentation by the way – our small team prides itself on very good documentation – so it’s nice to see it mentioned. Anyway – Eric. Thanks for taking the time. IMHO your comment “I’m sorry this review had to be such a shallow review” was right on the mark – and for that I’m sorry. I’m also sorry for this one “Right now I just can’t recommend it over Linux Mint, Ubuntu, or Mandriva for the new user”. You never gave it a chance. But like you, I know that everyone has an “off day” (your words again – “even my chosen distro of xxxxxx seems to falter every other release”). I believe the ‘off day’ this time wasn’t Mepis (it’s nowhere near perfect – but it is better than your review) – the ‘off day’ was yours. I hope you improve for subsequent reviews. Thanks for the critiques that were valid. We’ll make sure Warren knows about them. Although I didn’t mention it in the review, I did try vesa mode both on the LXF DVD and the SimplyMepis CD. How did you set up your vbox then – and what configs were you using? Reason I ask is simple – EVERYONE I know can run it using VESA option with the default cpu settings enabled (OK – you have to tweak the sound settings etc in vb – but you get my drift). If you downloaded the iso and got a good burn etc – then it should work (that’s the beauty of vb). What about the default from the grub menu – that should also work. I’ll leave this alone now Eric – I’m not a fanboi or a fanatic. Personally I think the majority of distros are fantastic. I just don’t think you gave Mepis a fair hearing. I enjoy reading reviews – but yours could have used some extra work in this instance. BTW – I did take the time to read some of your other reviews which were (on the whole) well written. I really would advise in future to create a separate build partition on your test machine and actually install the distros you review. That’s what most creditable reviewers do. who is this guy? his review looks like he was on a hurry to get the bus. Next time install a distro to speak about it. No need to wait for “the next 9.0” , my 8.0.6 works great here. Get back to photo shooting. It was a good choice including that last part, as the quality of the review goes. As for your methods, you should change them. Unless you also drive your car remotely from the safety of your home. Joke aside, the current Mepis might need a bit of tinkering but then again you can easily do it yourself – after installing it on the hard drive. The LiveCD offers less. That’s true, but many people try liveCDs before they install. So based on what htey see there, they will make their choice. I don’t believe in Virtual Box reviews… or for that matter any “I used the distro one hour” type of review. Hey, to realize if I want to use Firefox or Opera I used each for months. Same with distros, you get a feeling of what works and what doesn’t only if you use them for at least couple of days or even weeks, then you get an idea what the good parts of the distro are and what are its downsides. And how can you review the installer when you didn’t actually install it? BTW, I don’t remember having problems to install it in Virtual Box, actually I see I still have a MEPIS 8 installation on my VB. You probably did something wrong… not sure what, but I’m sure it’s fixable. Understandable sentiment. But I don’t have time to do those. Your “recommendation” based upon VM and live CD use is not reasonable. Not to a friend. Not to the public. You either had a bad day or you are careless. Mepis and Mint are the easiest distros I have found that just work. After installing and using several leading distros including Mandriva and Ubuntu, it became clear that Mepis and Mint deliver the most no-hassle installations. Mepis and Mint work well on our range of PCs and for a range of users. Mandriva is a capable distro. It generated more significant issues for me than Mepis or Mint, but I would never post such a negative “review” of Mandriva based upon limited experience, even far more experience though than you apparently had with Mepis 8. Regarding menus… KDE users in my house use the “Quick Launcher” applet. Nothing could more simple. I didn’t mean “I can’t recommend it” as in “it isn’t work recommendation”. I meant “I can’t recommend it” as in I didn’t experience it, so I can’t give a recommendation. I recently installed Mepis 8-64 bit on my computer after reformatting from Mepis 7. The only issue I had was something I misunderstood in the naming of the computer (no spaces allowed). That was cleared up after asking a question on the Mepis Lover’s forum. I’ve enjoyed Slackware and Slax-based distros, and Debian. Have tried many more distros, including Ubuntu (Ugh!). The reason I’ve stayed mainly with Mepis is that it just works. Reasonably stable and usually no complications with installs. Wow! You really stirred up the Mepis fanboi’s with this one!.. Look, Mepis 8 is a complete dud. It happens sometimes. Every distro has its not so solid releases and this one just happens to be one of them. Mepis 7 was, IMO, one of the better ones. The one before that was (if I remember right) based off Ubuntu and although I thought it was pretty good, alot of the same Mepis fanbois commenting here, were not happy with it at all. Go figure! Stop flaming the poor reviewer here for posting his findings. He is not lying, nor misreporting the facts. Just own up to the crappy release bugs and get them fixed before the next release. Thats how things work in the big bad world of Open Source. @Davemc. I am no fanboy at all, but pubishing a review based on a 30 minute experience with Virtualbox and the LiveCD cannot be taken seriously. I believe most criticism is based on this fact. If you read well, you can will see that people agree with some points, but also make clear that many things were not even discussed. So the reviewed did a poor job and has gotten his share of due response. @Carl. If it fails to run off the livecd or in a VM or virtualbox, it is broke. All the latest stable releases of all the major distros dont have these issues — including Debian, upon which Mepis 8 is based. That raises many questions about Mepis in general because the code base is solid and stable, but whatever Warren (and other Mepis devs) did, screwed things up. I don’t recall if Mepis ever worked in a VM or not, but I know it has always worked for me on livecd so I am not sure where the unstable code was introduced here. Its a shame. Regardless, these things should be easy fixes, and instead of fixating on flaming a reviewer, time would be better spent fixing the bugs, then ask the reviewer here to look at Mepis 8 again after these are taken care of. Who knows, he and others might actually chime in with glowing reviews then. As others have said – it does run. In fact, for most people I know – from live-cd and virtual box – no issues (apart from boot speed in VB). In fact Eric’s the only one I know so far that hasn’t been able to run it in VB. So that would point more to his set-up than not – wouldn’t it? Your common comment “it’s broke”, again is based on what? What do you fix when it works for everyone else? And – PLEASE – can YOU at least try it yourself in VB, and see if you can install it? I’m really interested. If there is a fault, I’d rather let Warren know. At the moment – for this particular issue – I see one person with the problem, and only one. How do you fix it if it isn’t broken? but MEPIS 8 does run in VB and off a livecd so it is not broken. It appears broken only on Eric’s box, which suggests a problem with his download or the dvd or how VB is set up on his box. I think this shows how complicated Linux distributions are. For my Ubuntu Review I was able to install it into the VM without changing any settings relative to what I had in SimplyMepis. Eric, just to check out something, if you wish. Try antiX-M8 and see if it boots in VB. If it doesn’t then you may be right about something in the M8 release that causes problems. If antiX-M8 boots ok, then there is something wrong elsewhere. @davemc and eric: you guys seem to cling to an opinion that is at least circumspect. I keep insisting that a one-off attempt to install in VB and a superficial run on the live CD are not sufficient to qualify your piece of writing as a review. There is ample circumstancial evidence (i.e. : people that installed MEPIS 8 successfully under VB) that seems to prove the fault is the reviewer’s rather than the distro’s. Just maintaining your point of view ‘it didn’t work for me so it is broke’ is rather short sighted. I don’t care if you don’t like MEPIS. But I do care if you write negatively about it (or any other distro for that matter) based on what might be user errors or simply a bad burn or download. I don’t mean to sound rude but any review using a VM is garbage. Get a late model used desktop PC and do it RIGHT. You simply CANNOT (ever, ever, ever and I cannot emphasize this enough) do a real review on a VM. Workflow or not, you are not doing anyone any favors with your ‘reviews’. There was some very comments made regarding this review and I can appreciate the reason for most of the comments. However! I have to agree that the only way to test drive any OS is to install to HD or test its Live CD capabilities from CD/DVD rom. I personally think Simply Mepis is the ducks guts. Stable, quick and very configurable. I am not a Linux guru nor do I profess to be an expert, but I have tried and used over 30 Linux flavours over the last 9 years. 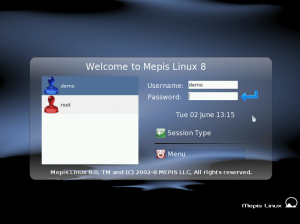 I love linux and Mepis is one of the best out there. A fine OS for all levels of skill. From the Joe citizen point of view Linux has come of age in the last 2 years. There are different strokes for different folks and that is what makes Linux in general so good. I enjoyed reading all your comments. Long live Linux and thanks to all the people who helped make these OS’s available to the masses. I don’t mean to sound rude but any review using a VM is garbage. I have to agree. What a piss poor review. as a “regular user” (at home desktop), I don’t fool with VM for anything. I want a simple distro that lets me listen to my music and surf the web and keep up with my friends. Mepis is beyond exemplary. Sometimes it is a little glitchy when loading up. Mepis was my first taste of Linux, from Mepis I went to fedora and then to ubuntu. If I want something that works good and doesnt argue with me about ownership of a file, I use Mepis. I like the look and feel of Fedora, and I’m checking out Ubuntu because of it’s popularity, but Mepis is now standard on my system. BTW, I keep MS Vista w/Aero, because no linux distro out there holds a candle to the look and feel of it, and it works just great. Not everything pans out the first time. I’ve reinstalled Mepis several times now to get my HD the way I want it. (Aero, then Mepis , then personal volume, then Ubuntu ( and was Fedora, but I’ll redo later). Because of Mepis I understand GRUB, which i now use to boot windows as well. This review was interesting and informative, more-so from the comments left. Despite the negative experiences, I would push this onto any noob, with the encouragement to explore more and other distros. Thanks. Groan. Another dumb review by somebody trying to use vbox/vmware. Do me a favor and don’t do anymore reviews. What the hell is wrong with people these days? Lots of comments on here, everyone’s entitled to their opinion. I installed Mepis on a PIII 500 Mhz with 384 MB of RAM, live CD boot was slower than most other distros but when installed, it runs great on an old box with limited resources. For me, that is the true test because I can recycle old hardware, put Mepis on there, give the box to someone who wants to surf the Internet and read emails and they have a stable secure box that will work. I have been using Mepis since (6) and I have always been extremely happy with it. Although I am sure everyone who experienced some problems were a bit frustrated, once installed, Mepis just works, same can be said for Fedora and Ubuntu in my experience. Love the distro, enjoyed the review and the comments. Linux is such a great OS, can’t say how happy I am to be rid of MS.